SuperiorRx Card Offers Walmart’s Prescription Discount Savings Program – Superior Benefits Insurance Marketing Corp.
Superior Rx Card, brought to you by Superior Benefits Insurance Marketing, Inc., is a prescription savings program that gives your special negotiated rates on your prescriptions at your nearest participating Walmart or SAM’s club pharmacy. In the event that the negotiated rate would ever be higher on a particular drug than Walmartâ€™s Every Day Low usual and customary price, you will always be charged the lower of the two prices. This program is offered free to individuals and families, or businesses as a free benefit to employees. 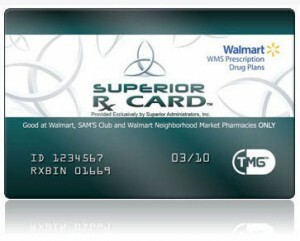 Simply present the SuperiorRx Card at a participating Walmart or SAM’s Club pharamcist, and enjoy the savings. This card is also good at Walmart’s Specialty and Mail Order Pharmacy.